While there were so many magical moments on our journey to Bali, here are just a few of the highlights from our unforgettable adventure. 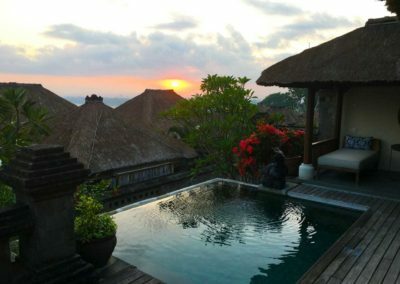 We arrived at the luxurious Four Seasons Resort Bali at Jimbaran Bay surrounded by breathtaking views of the Indian Ocean. 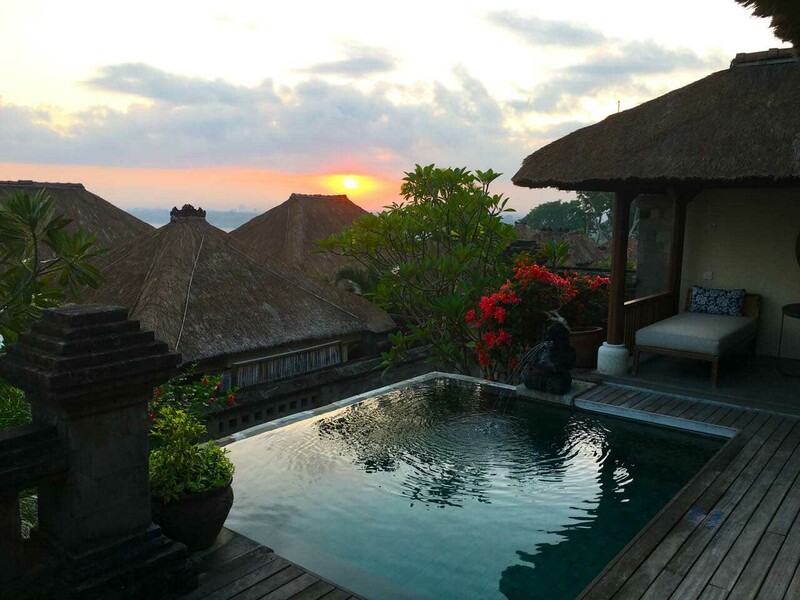 Since many of our guests arrived early, we planned an early morning spiritual experience to Uluwatu Temple. 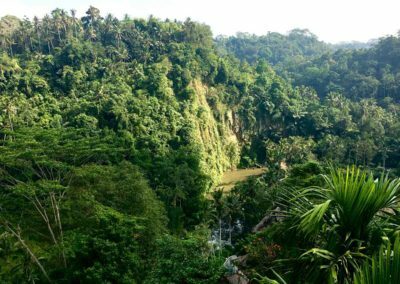 Renowned for its picturesque location perched atop a steep cliff 70 meters above sea level, this temple is one of Bali’s spiritual pillars and one of six key temples on the island. 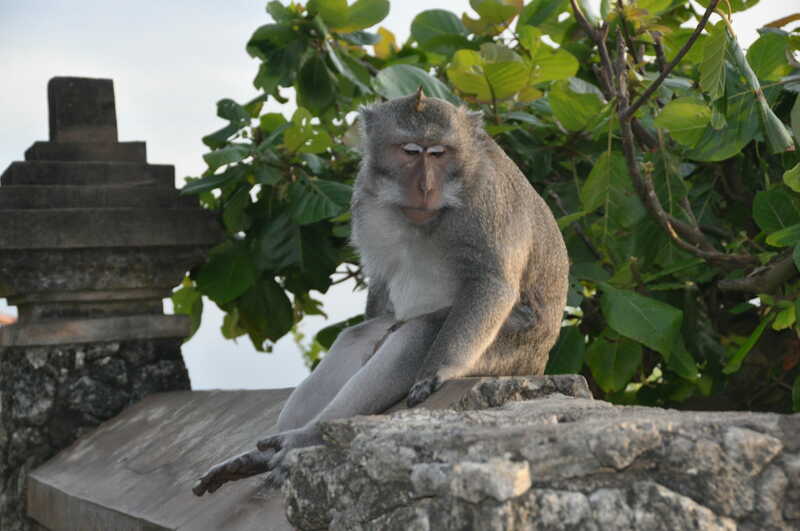 Be warned though about the cheeky monkeys…one of our guests had their glasses stolen straight out of their hands by a mischievous macaque. Our first official day ended with a lovely welcome reception at the resort overlooking the ocean. Each guest was wrapped in a custom Divine Destination Collection purple sarong before being blessed by a local priest. 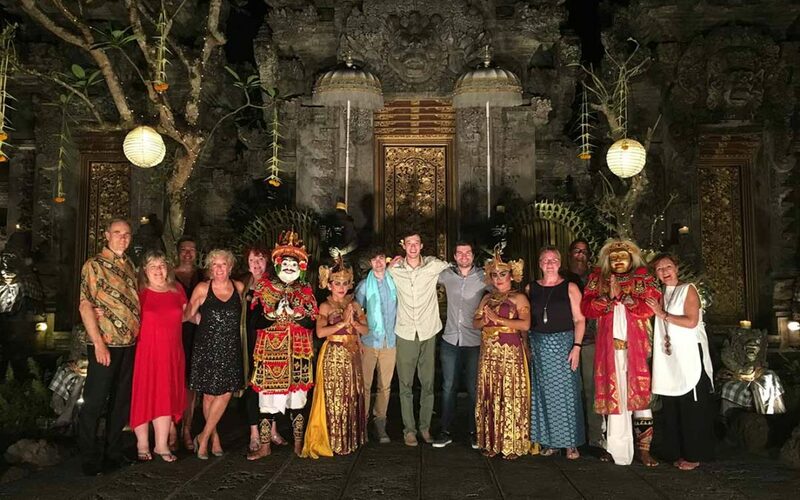 A wonderful welcome to the magical isle that is Bali. The next morning, the Executive Chef of the Four Seasons Jimbaran personally escorted us through the local market for an amazing culturally immersive experience and an up close & personal look at day-to-day Balinese life. 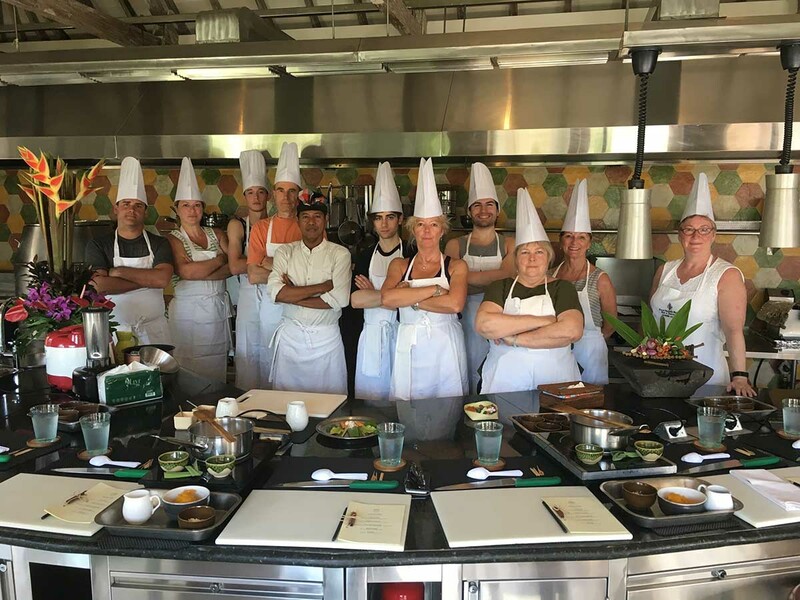 The Jimbaran Bay Cooking Academy provided us with hands-on Indonesian culinary training where we learned secret local cooking techniques using organic Indonesian ingredients, some from the resort’s very own gardens. 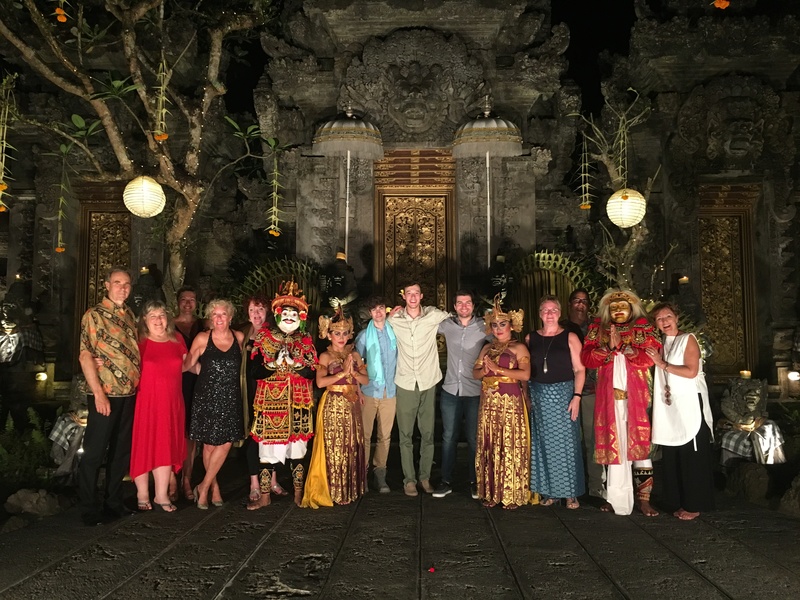 The day culminated with a Fiery Balinese Beach Party, complete with delicious Indonesian food, fire dancers and an explosive surprise! We capped the evening off with the song stylings of one of our own guests, Jack N., who jammed with the band. 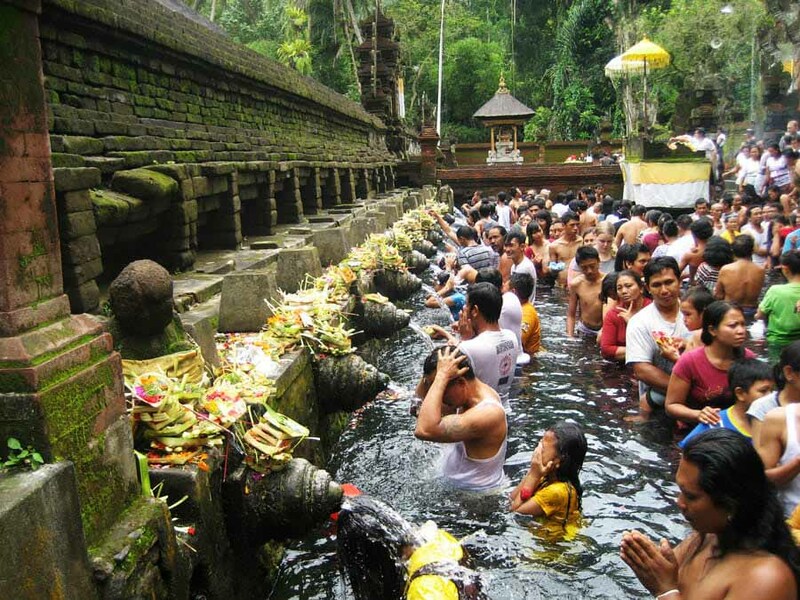 Our journey into the spiritual side of Bali continued with a visit to Batukaru Temple. 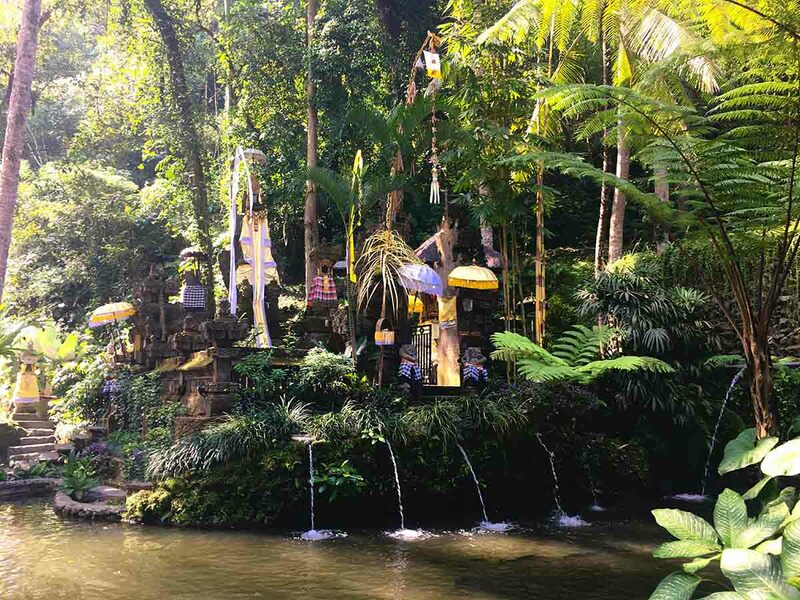 This temple is surrounded by picturesque natural forests at the foot of Mount Batukaru, Bali’s second highest volcano. 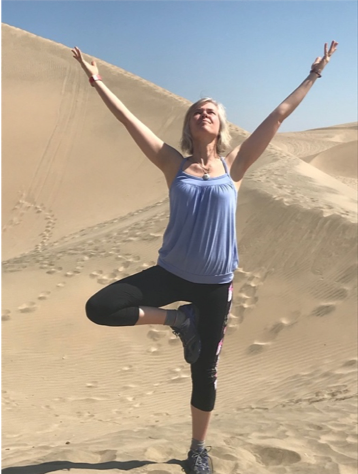 We had the incredible fortune of being at the temple during one of their most important festivals, even our guides were awestruck by how special an experience this was. Another wondrous “peek behind the veil” moment into Balinese culture & traditions. WOW! 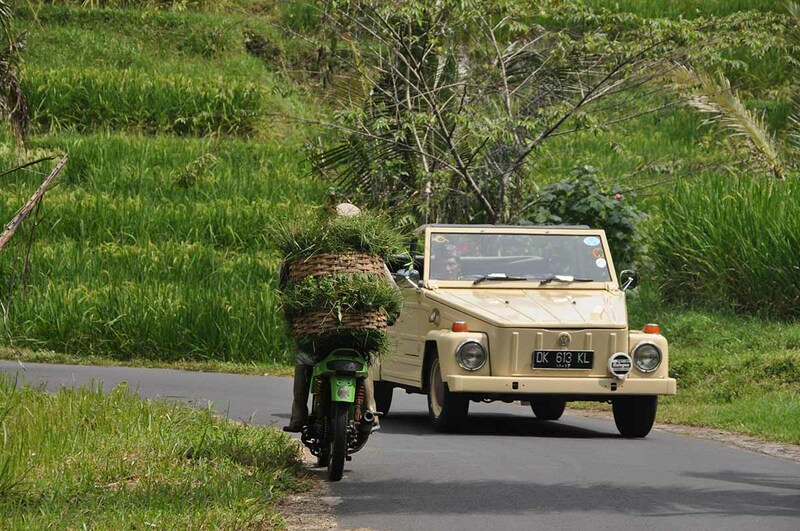 After our special visit to Batukaru Temple, we hopped aboard VW convertibles and had a leisurely drive through the serene bamboo forest and famed Jatiluwih Rice Terraces. A UNESCO Cultural Landscape, this region is truly stunning and exotic. 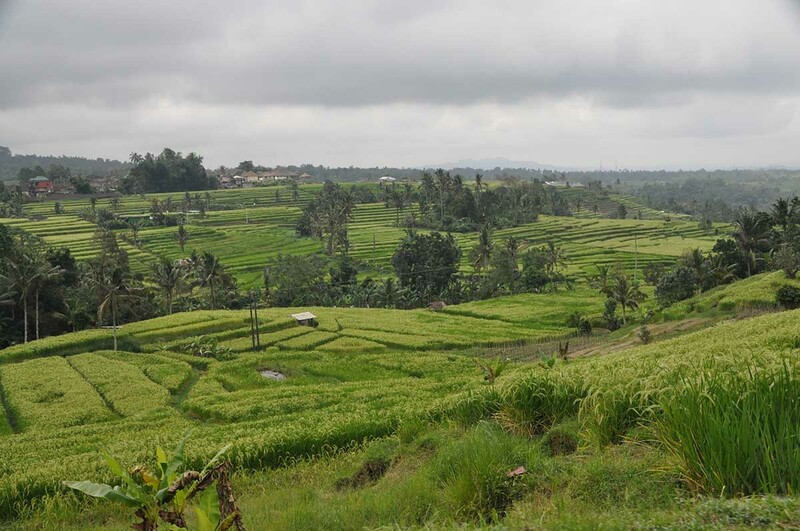 We ate a delightfully casual (yet tszuj’d) lunch overlooking the picturesque rice terraces. 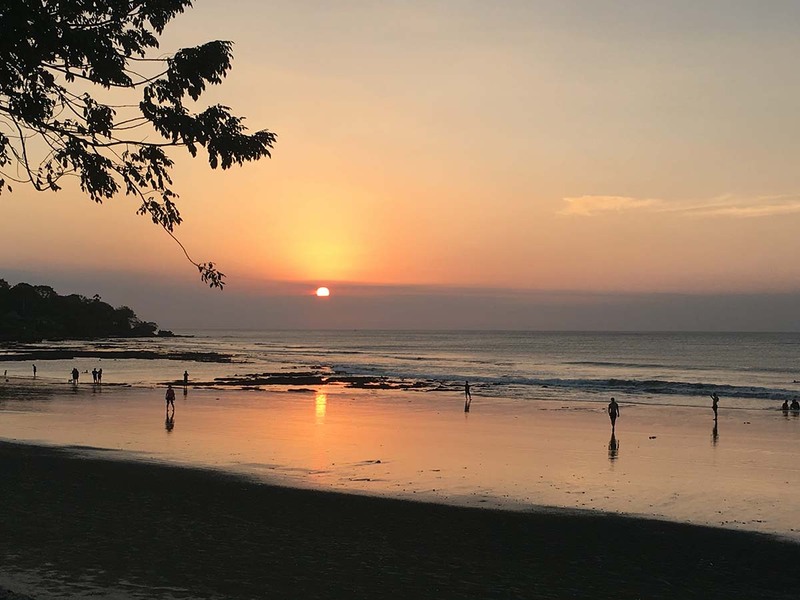 For our afternoon adventure, there is no better way to enjoy a Bali sunset than by sea…so we embarked on a private 2-hour cocktail cruise aboard a luxurious 50’ Catamaran… taking in the breathtaking sunset and reflecting upon the serene beauty of Bali. 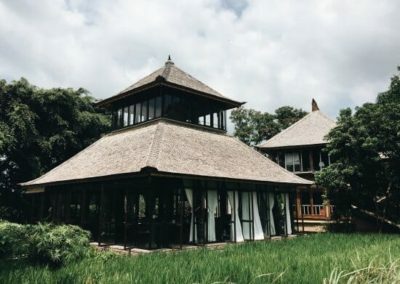 After spending 5 days at the beach we headed up country to Ubud and the breathtaking Four Seasons Resort Bali at Sayan. 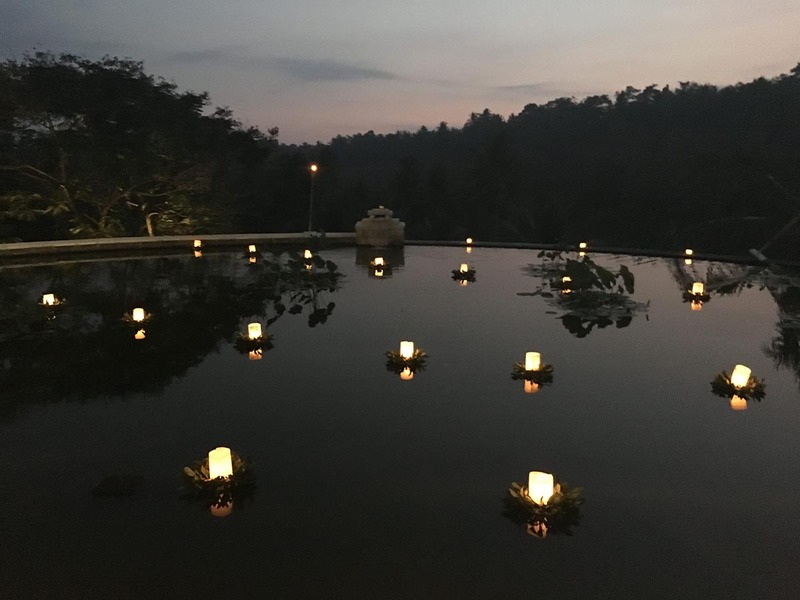 Here we watched the sunset over the jungle on the resort’s stunning rooftop lotus pool while dining on the best fillet of beef our guests had ever tasted! 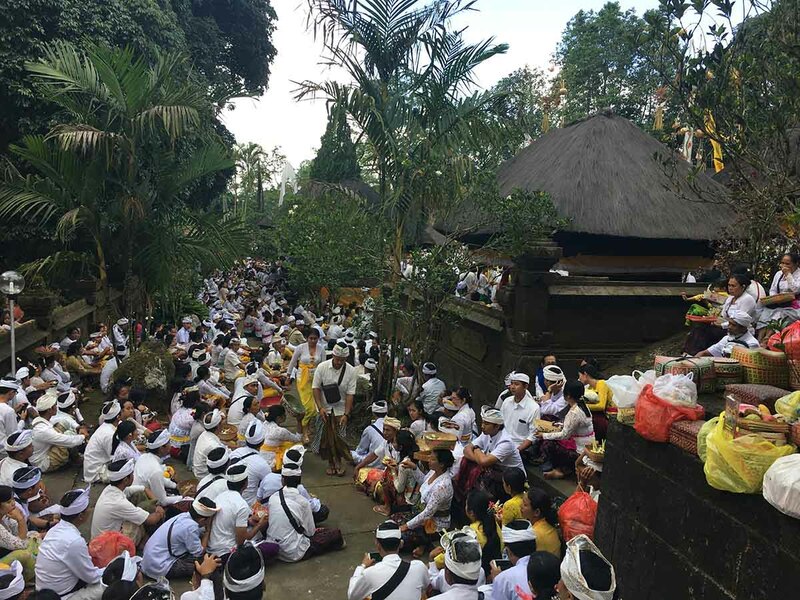 Balinese dancers set the tone for the next 5 days…Selamat Datang ke Ubud! 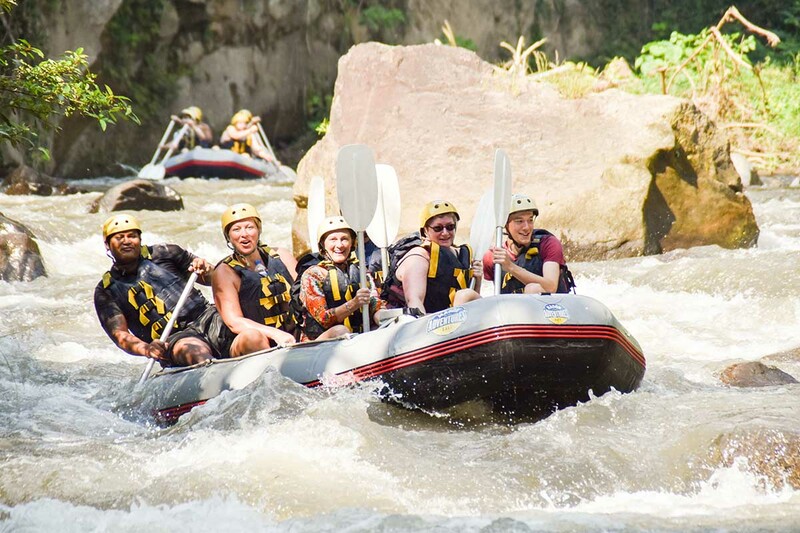 One of the highlights of our trip was rafting on the Ayung River. There were lots of laughter and a few heart palpitations as we plunged down this spiritual & healing river, which has been drawing people to its banks for centuries. After this heart-stopping adventure we swam and had a leisurely lunch riverside at the magnificent Royal Pita Maha. 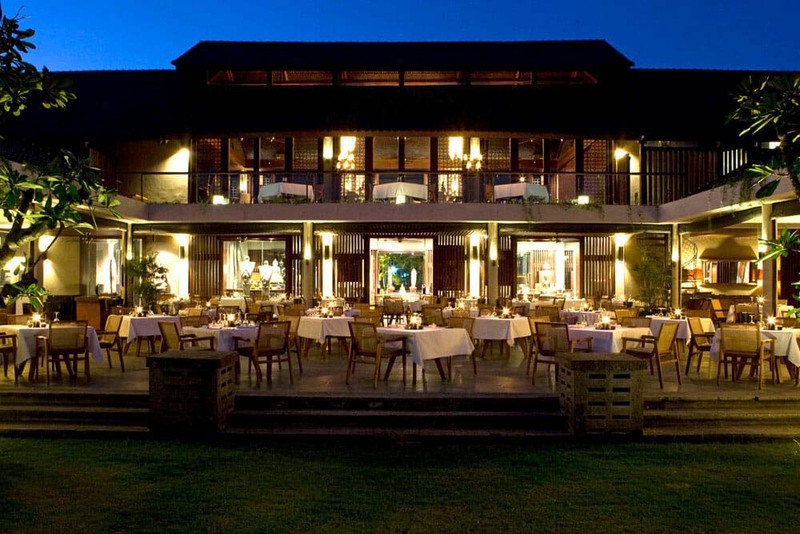 Our farewell evening was spent at an extraordinary traditional Balinese compound. What started off as simple cocktails soon became a full on parade with a magnificent procession of dancers and torch bearers leading us to dinner. To the delight of all, each course was presented with true pomp & circumstance…dazzling Balinese singers and dancers completed this regal evening. Built by Ubud’s Royal family, the walled compound features a large garden courtyard filled with traditionally inspired structures, providing the perfect atmosphere to bid farewell to the beautiful majestic island of Bali. We are so blessed and receive so much when we visit a destination, that it is our vision to always leave a place better for having travelled there. 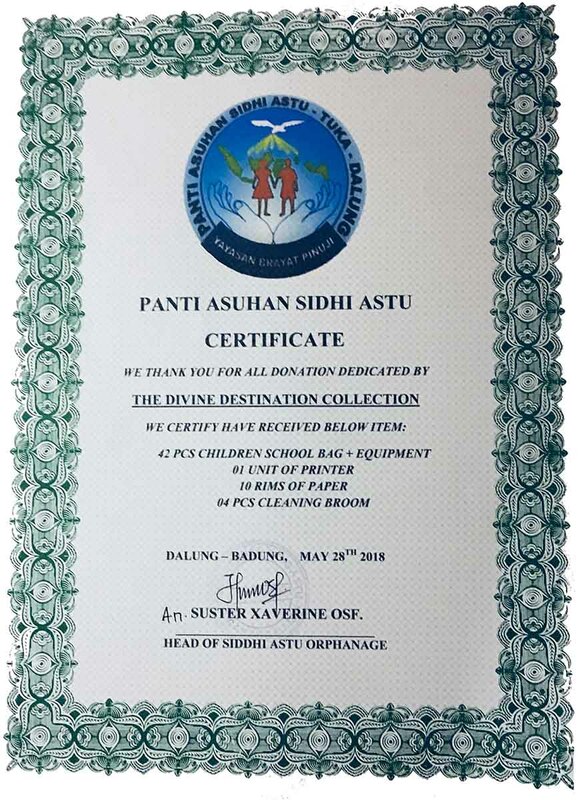 Therefore, before departing, we made a modest donation to a local orphanage and were so touched by a certificate of gratitude they presented to us outlining all the supplies that they would be able to purchase with these funds. A visit to the Turtle Conservation and Education Center. 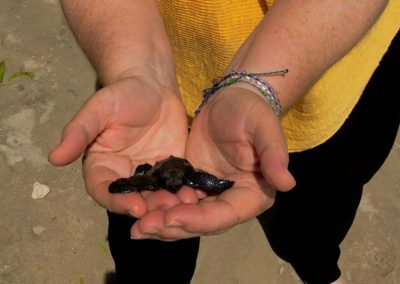 The rescued sea turtles and turtle eggs are cared for at the centre and the hatchlings are released into the wild. 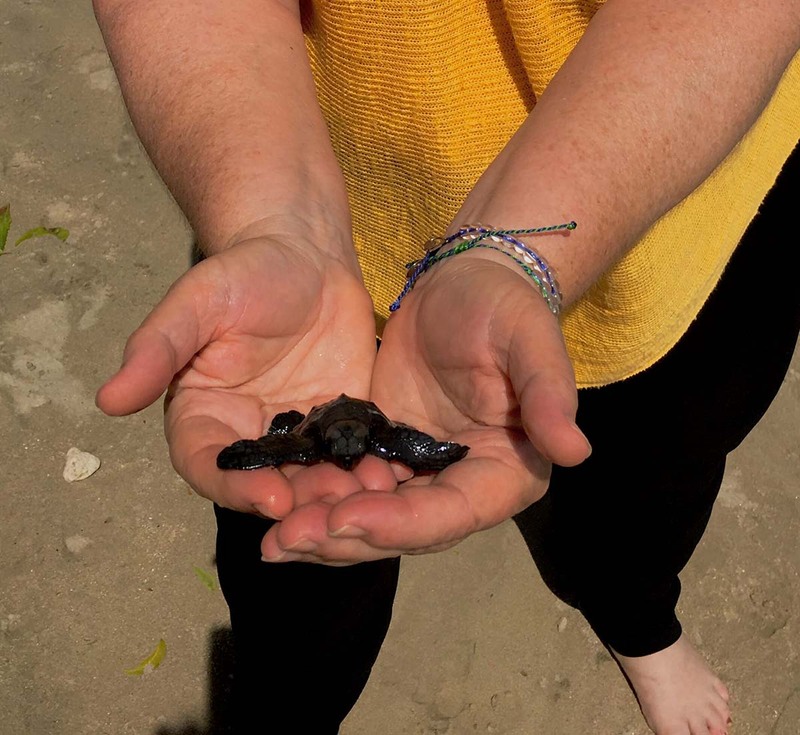 We had the incredible heart-warming opportunity to actually release baby turtles into the sea. 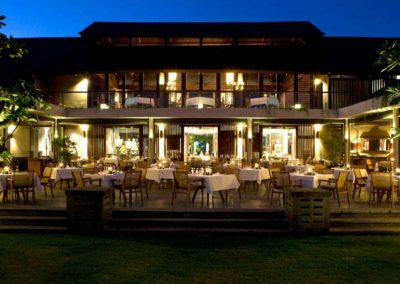 A foodie’s paradise with dinner at two of the island’s famous award-winning restaurants, Metis in Seminyak & Mozaic in Ubud. A culinary feast for all the senses. 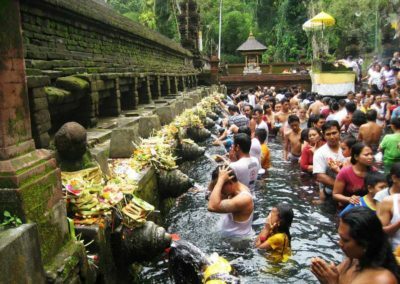 A visit to Tirta Empul Temple provided a unique view of Balinese rituals. Worshippers first make an offering at the temple before climbing into the bathing structure for a ritual purification of the body and soul. Some travellers collected the holy water from the spring in bottles to take home. 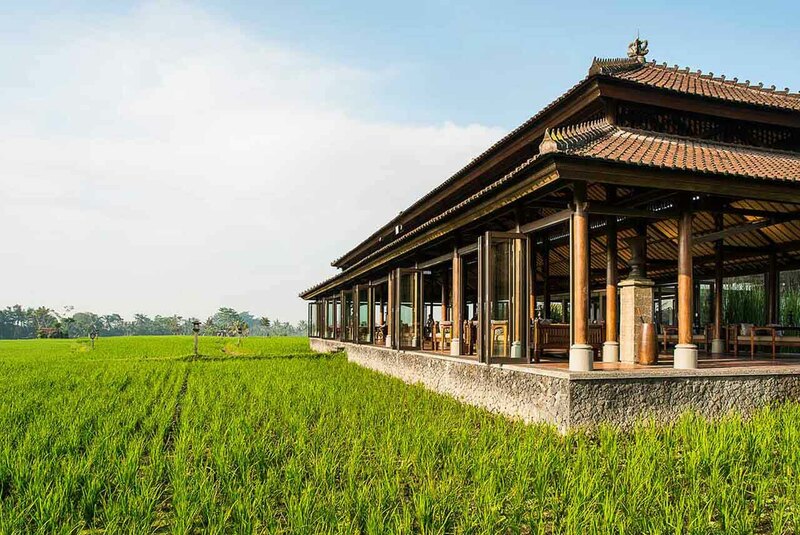 A scrumptious “Paddy-to-Plate” lunch at the Chedi Club overlooking the Tanah Gajah rice fields. 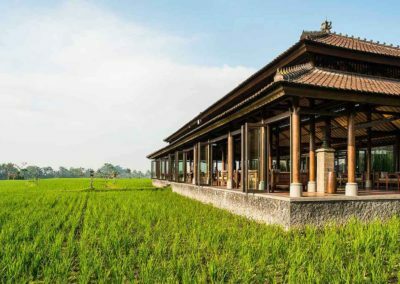 A visit to a Traditional Balinese Compound to see first-hand the fascinating architecture that makes up a traditional home. A visit to John Hardy Jewelry Workshop and Showroom, founded by Canadian expat John Hardy in 1975, this workshop is world renowned for its dramatic Asian inspired handmade jewelry designs. Stay tuned for our Bali video which will be uploaded on our website within the next couple of weeks!